Dmitri: Even those from whom we haven’t expected messages congratulated us. The friends with whom we haven’t communicated for a long time, overseas competitors, and their sincerely wished us success at the European Championships and a soon meeting at the World Championships. Dmitri: Kaitlyn Weaver. We are friends with her and Andrew Poje. They are very good guys. Ekaterina: We have known each other since the junior tournaments. Dmitri: Zach Donohue sent a message. They are with Madison Hubbell very interesting athletes in their own way. In general, each of the top 10, even the top 15 is very diverse. Ekaterina: This American friends have made a huge breakthrough this season, got in Grand Prix Final. We are very happy for them. They pay attention to the Russian Nationals? Dmitri:Well, of course, we are watching each other, we look at what is happening in the world. Ekaterina:At the Russian Championship the fight was very exciting. Until the end it was unknown who will go to the European Championships. It was interesting to everyone to look at our home fight. Do you have a significant breakthrough in this year or “everything is going according to the plan”? Ekaterina: We have more an emotional joy. We returned! And we believe in our team. That is the main thing, and we get a buzz from skating. The return was at the Grand Prix in Canada? Dmitri: Awareness of return appeared not even in Canada but at Grand-prix in Japan. There we felt the strength to compete. Because in North America the start was so nervous that I must confess, I have never in my life experienced such a nervous state before. I worried very much. In Nagano it was much easier, I was much more confident on the ice and tried to pass my persistent state to Katya. And we made it. And in the Final in Barcelona you were nervous again? Dmitri: I was nervous, but purely in the competitive way, nothing special. Ekaterina: Not like at the first international start. Samara (the stage of Russian Cup) do not count, in Saransk we haven’t started. In Barcelona Sasha (Alexander) Zhulin said to us simply: “Well guys, just enjoy! You are in the final.” And we were having buzz. After all, we didn’t expect to be able to skate in Final. Dmitri: We were having joy and the trainings were clean with an excellent mood. Ekaterina: We laughed. In Barcelona we skated in the same group with the same Maia and Alex Shibutani, Madison and Zach (Hubbell / Donohue) with whom a week earlier skated in Japan. In seven days nothing has changed, we felt ourselves in the Final like at trainings, if we skate on the warm-up at home. Have the ice dance changed in comparison with the Olympic season? Ekaterina: Ice dance is progressing. And it’s great. Dmitri: And by 2018, they will progress even more. Each pair will have something their own and at the Games it will be a bomb. The explosion of something really new. I don’t know how exactly, but ice dance will improve. Ekaterina: Each pair will experiment with new lifts, music, choreography, someone will do it well someone no. Now there is no clear leader, and all of us are in such conditions when you need to stand out. Otherwise you won’t breakthrough as Canadians with Americans (Virtue Moir and Davis White) did in the Olympic year. Everyone knew – they are untouchable. Therefore you need to take your place in ice dance before the Olympics in Korea to be more calm. Thoughtful analyst Maxim Staviski said that “Anna Karenina” it’s just “your”. Dmitri: “Our“, I agree, but note that “our” of this season. Ekaterina: Exactly. About “Crazy” also spoken as of “our” program. But who would have said so in 2015? No one. We would have been ruthlessly buried with it. Dmitri: This doesn’t mean that this theme will be good for us in a year. Not the fact that we can win if we bet on proven and will not take risks. Everybody is trying to find something “theirs” but the ideas, characters must be new, and every time it must be said that it’s “our”. It’s better but this is even better … And this is generally superb. The Olympics 2018 waiting for such dynamic of dances from the leaders, and we must meet this expectations. Ekaterina: We want to show that it is possible for us to skate not only to classics and to change. And it’s interesting for us. Ekaterina: Sasha (Zhulin) often shows us something of the former ice dances and requires to put a foot as they, the skaters from the video. And then he asked: “Why you can’t do it?” And that’s fine, because each generation has a lot to learn from. Dmitri: We periodically come back to the 80-90 years to watch how Usova / Zhulin, Grishuk / Platov skated. The greatest couples, on which you need to complete with but remembering that now is other programs, complexity of the elements, another evaluation. But figure skating has not been canceled. Previously, you were competing with Ilinykh / Katsalapov. Today, who is your main competitor? Dmitri: At the Russian Championships Nikita and I vent on ice like on the ring. Both against each other. In good sporting sense. Starting from the training we spurr each other. On the result. Who is better. Who is stronger. For me it’s a great battle. Such competitor in your country encourages to work even harder. Nikita has the same opinion and it’s interesting our feelings can’t be fully explained. Ekaterina: For our boys it’s apparently great. Their characters need it. And that battle is only for boys? Ekaterina: I don’t know how the other girls, I don’t go with the feeling that I should beat all competitors. I go on the ice with the feeling that I have a partner, and that we are well taken by the audience, that in some minutes we will show our favorite program. I don’t even pay attention to those who are near. From rivals. Nikita spurs Dmitri but not you? Ekaterina: Nikita definitely not (laughs). 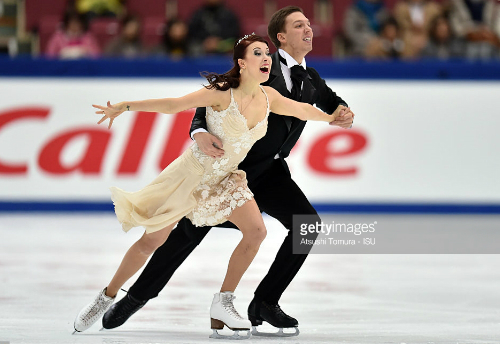 Ekaterina: If we were running a race at the ice with them and I saw that they are racing near me it would have spurred me to fly forward…………………….But on the ice I’m with my partner. Dmitri: At the same time we communicate with Nikita very well, we can go somewhere to talk. Outside the ice, we‘re friends, we have no competition in life. But when we leave on warm-up, looking into each other’s eyes and … “Well then, come on? – Come on!“. For not to relax. Ekaterina: Our team is very strong. We are very happy for Sasha and Vanya (Stepanova and Bukin), who will go to the European Championships. Someone predicted the first place at National Championship for Lena and Ruslan (Ilinykh and Zhiganshin) but something vent wrong for them at this start. Error in short, perhaps, did not allow them to get into the top three. All of our four couples constantly shuffle, and it’s wonderful. I faithfully said during the Championship about the return of all three first places by Russian pairs at main competitions around the world. Isn’t your plan is too idealistic for the World Championships? Ekaterina: All the same, we all have goals and desires, nothing is impossible. Before the Olympics in 2018. Dmitri: I think it’s impossible to focus only on one pair, one athlete. You can’t. How our overseas competitors do? Together. Three American pairs in the Grand Prix Final. Three! That says a lot. It’s simple: skated better – you’re the best. And if it was a bet on you and you make mistakes? And what do than? It’s silly. We have a Russian team – the team. We all need to go forward, and we can achieve this. Ekaterina: It’s important that all pairs will be ready. Good prevent that it happened again that we lost a spot at Worlds. There were three decent pair, each of which claimed for a significant position, and as a result seventh, eighth, ninth place. Sadness. After the Olympic season we lost pretty much. But ahead the Olympics, we have time and we will catch up missed. Although this will be a jump in the last train. We should not miss this opportunity. I think that dance it’s a passion in which always played a love story in different ways. You keep talking about friendship and partnership between you. Is it possible to get maximum in this sport only with professional relationship? Ekaterina: We work a lot on acting. And there are many stories about the filming a movie when actors simply hate each other but play beautifully the love scenes. We are good friends, and it only helps us. And if we, say, have been dating and suddenly had fight? He didn’t take out the trash and all…we quarreled … I would have been more difficult to play love on the stage. We are good actors, Sergey Petukhov really helps us, he can amazingly tell what we should feel in a particular movement, step. It is important that he hears us, knowing what we are able to show. While hatred is also a good feeling to play love. Dmitri: Yes, the worst is indifference. But I think, and Katya agrees, that our friendship is just a plus. This friendship has lasted many, many years. Even in thoughts there haven’t been nothing else. Dmitri: Right. And even an idea to try other ways has never occurred. Ekaterina: We even haven’t been in a movie together for this fifteen years. Friendly business relations. We come to the ice and share our stories. We know very much about each other, even those secrets that others do not know. This helps us to unite and feel like special friends. Ekaterina: And because of what? We haven’t domestic issues. Dmitri: We haven’t a cause for conflict. To yell at each other, to blame you do not know how to skate, to go to different corners … Just to lose precious time? How often do you need a rest from each other? Ekaterina: We see each other only at the rink, we communicate only in competition and trainings. Dmitri: What weariness! We just got back and want to do something important.